Spiritual Warfare is a fuuuuunnnn topic for Sunday School teachers. In the past I’ve suggested some tricks you might use to jazz your Armor of God lesson up a bit. Today, I want to give you the script for teaching specifically, about the Helmet of Salvation. So without further ado…. Okay, I need a volunteer. Anyone? (Pull one volunteer up to the front). Okay, I brought all of these pieces of armor… but I can’t remember where any of them go, or what they do. Can you help me? What does this have to do with salvation? Sending messages to your body? First, we have the belt of…. TRUTH! What does the belt of truth do? It keeps you from looking like a fool because you know the truth holds everything in place. Then, we have the breastplate of… RIGHTEOUSNESS! What does the breastplate of righteousness do? It protects your heart from being dirty with sin! Next, we have sandals of… PEACE! What do the sandals fitted with the readiness that comes from the gospel of peace do? They keep you from living in fear and in pain, because you know Jesus and what He does for you! Then, we have the shield of… FAITH! What does the shield of faith do? It helps protect you and extinguish what Satan tries to hurt you with! Well, today, we’ve got this big clunker of a helmet… Does anyone know anything about the helmet? This is a Roman helmet. What do you notice about it? You probably notice that it’s made of bronze and iron, right? It certainly looks pretty sturdy, doesn’t it? And you’ll notice it doesn’t just protect the top of the head, but it also protects the neck and the side of the face. Plus, it’s got this brush on the top for sweeping, right? No, I’m kidding. The brush was just designed to show everyone else how awesome the person wearing the helmet was. The helmet’s purpose was to protect the head and the neck. It protected the head by putting armor around it, so that whenever anything came up against it, it would hit the metal—not the skull. If someone tried to stab you in the head, the sword would clang against the metal, and it would do no harm. It also stabilized the neck, so that if the soldier was thrust in an uncomfortable position, his neck couldn’t crack. The neck holds the spine, which is essential for getting information from the brain to the rest of the body. 1) It protected the brain from attack. 2) It ensured the brain could send messages to the rest of the body. Without the helmet, the rest of the armor would have been considered useless! Do you remember learning about David and Goliath? Goliath had all of his armor on, but it did him no good! Why? Because David attacked him in the head. He got him in the part of the head that wasn’t covered, and Goliath died instantly. The head is the center of the human body, and it’s protected by a helmet. 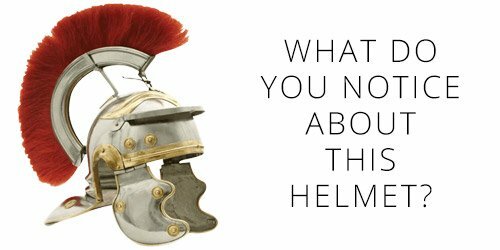 But when we talk about the armor of God, what kind of helmet are we talking about? Let’s read Ephesians 6:10-17 to find out. (Read aloud, letting kids do motions or shout out anything that was in previous lessons as you do). The helmet is the helmet of… SALVATION. 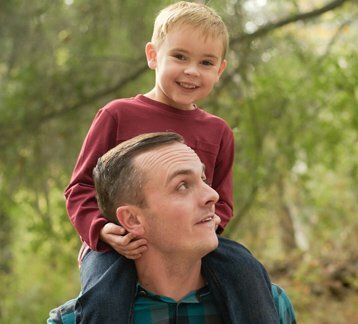 Now whenever I say “helmet” from now on, I want you to knock on your head (show the kids). And when I say salvation, I want you to reach your hand out, like you’re saving someone from falling. Ready, let’s practice… Helmet… of Salvation! (repeat 3x). Okay, perfect. I think we’re ready to begin. So we know that the Roman helmet did two things. What were they? It protected the brain from attack, and it ensured that the brain could send messages to the rest of the body, through the spinal cord. In the armor of God, it’s the helmet of… SALVATION that protects the brain from attack, and ensures that the brain can send messages to the rest of the body. How does salvation protect the brain from attack, though? Well, think about it. Salvation means you’re saved from something. If you were to watch a superhero movie and see a woman falling from a burning building, you’d think “uht-oh!” Then, you’d watch as Superman flew underneath her and caught her, and you’d hear her say, “oh, Superman, you saved me!” That’s salvation. Salvation is when you’re headed toward death, but somebody swoops in and save you. In our case, as Christians, we were all falling to our death. Remember, we talked about sin, and how Adam and Eve “fell” in the Garden when they sinned? And we talked about how we needed a savior, someone to save us from sin so that we could be with God? That savior was Jesus, and his act on the cross was an act of salvation. So really, what this verse means is we need to protect our brain from attack with Jesus’s act on the cross… and it also means that what Jesus did for us on the cross allows our brain to send messages to the rest of the body. Huh? That doesn’t make any sense, does it? Well, no. Because here’s the thing. What Jesus did on the cross was an act of salvation, but our salvation isn’t complete. Jesus wants to save us, all of us. But we have to use our brains and decide that we want him to save us. We have to decide that we can’t save ourselves, and that we want to live for God. When we do that, we grab the helmet of salvation and put it on our heads. (Put the helmet on the head of the volunteer from earlier). Now, our guy has the helmet of salvation on his head. You know what this means? It means he’s protected. He’s protected from a life without God, he’s protected from someone dropping melons on his head. His brain is protected from attack because he knows that no matter what happens, God is in control. God is protecting him. But what about the other part? The whole sending messages to the rest of your body thing? Well, here’s the funny thing about God. When you accept the gift Jesus gave you, the salvation, EVERYTHING changes. There’s a verse in the Bible that says when you become a Christian, you have to be transformed by the renewing of your mind. It means that you start to think differently as a Christian, than you did before you knew God. Christians should always be more compassionate, thoughtful, and loving than people who don’t know Christ. Why? Because a Christian has been given a gift that makes them super super thankful—the gift of life! So a helmet of salvation is what enables you to think differently. When you start to think differently, you start to act differently. Your hands become helping hands. Your feet become serving feet. Your mouth starts to say good things, instead of mean things. Your eyes start to see beauty in the world. Your ears start to listen to things that are good for you. You start to live a life focused on God, and focused on what God wants for you. Why? Because your brain is so saturated in who God is and how much He loves you, that it starts sending different messages to the rest of your body. Your brain knows “Hey, God loved me so much He died for me, and I choose to follow Him!” and it sends that message to the rest of your body, and the rest of your body follows suit. That’s what the helmet of salvation does. And just like a Roman helmet protected the soldiers and helped ensure messages could be sent to the rest of the body, a helmet of salvation protects a Christian, and helps ensure that they become more and more Christ like every day. Hi, I’m Nathan, and that’s Nolan. I’m a husband, a dad, and a Sunday School teacher. 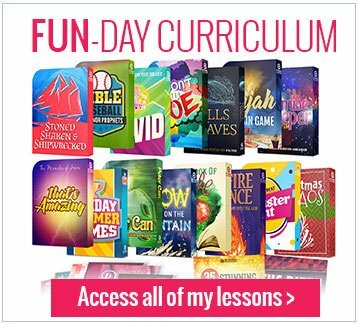 BetterBibleTeachers is dedicated to teaching the Bible to kids in crazy interesting ways. 10 anti-lame object lessons (with videos) that are pretty much guaranteed to make you a better teacher. My variation on a common method of teaching faith to kids. Pretty self-explanatory. A complete Sunday School lesson on Adam and Eve in the Garden of Eden. Some key criteria you should consider when evaluating curriculum for your kids.